Tulpenrallye - I Say Ding Dong Shop - Buy Stickers, Decals & Unique Automobilia. Bilstein Race & Rally Coloured Screentop Sunstrip Visor. 55". Castrol Race & Rally Coloured Screentop Sunstrip Visor. 55". Leyland ST Race & Rally Coloured Screentop Sunstrip. 48". Shell Sport Race & Rally Coloured Screentop Sunstrip Visor. 55". Tulip Rally Tulpenrallye 1962 Dutch Flag Rally Plate Sticker. 6". Tulip Rally Tulpenrallye 1962 Orange Union Jack Rally Plate Sticker. 12". Tulip Rally Tulpenrallye 1962 Union Jack Rally Plate Sticker. 6". 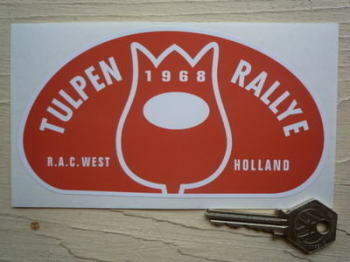 Tulip Rally Tulpenrallye 1963 Orange Rally Plate Sticker. 12.5". Tulip Rally Tulpenrallye 1963 Orange Rally Plate Sticker. 6". Tulip Rally Tulpenrallye 1968 Orange Rally Plate Sticker. 6". Tulip Rally Tulpenrallye Noordwijk Rally Sticker. 3.25".